Who is Yovana Mendoza Ayres of Rawvana? Is she the fake vegan influencer duping her followers while eating eggs and fish? While influencers behaving badly such as getting into spats and posting controversial opinions is more common, fitness and diet influencer Yovana Mendoza Ayres was flat-out lying to her followers with dangerous claims about her health and the diet plans she was pushing them to buy. Who is Yovana Mendoza Ayres? 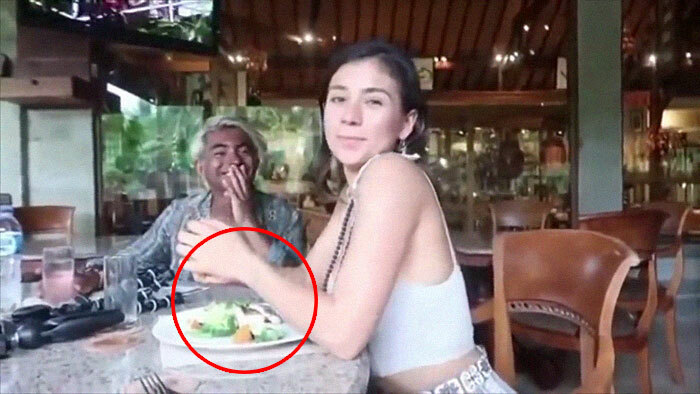 According to reports, the YouTube influencer behind Rawvana, a raw, plant-based diet and lifestyle transformation program, was caught eating fish in a video. You can watch the video below, and see that she has white fish on her plate. You can see as the video pans towards her, she surreptitiously looks down at her plate then tries to hide the meal with her forearms, trying to smile. Do you think she knew that this was the beginning of the end? Once the video was uploaded and viewed, her followers felt betrayed. They called her out on her eating fish, especially since she was pushing a 21-day “transformational” challenge and ebook about how a raw, plant-based diet could do wonders for her followers’ health and lifestyle. So what’s a fake vegan influencer to do when she’s found to be eating fish? Make an apology video. But things may have gotten worse for her as she explained why she was eating fish. According to her video, various health problems had arisen from her plant-based, raw diet in 2016. She had started the diet that only allowed her to eat fruits and vegetables that haven’t been cooked. She had also undergone a supposed “water cleanse” that entailed ingesting only water for 25 days. According to her videos, the experience left her feeling good about herself. She also noticed that she stopped having her period and initially thought it was a good thing, but later regretted it. We won’t link the video here, but you can certainly search for it. Upon speaking to other people living her raw lifestyle, she decided to go to a doctor. After some tests, her video said that she was considered pre-menopausal based on the hormonal imbalance her body was in due to her diet and other factors. Related Post: [GIVEAWAY] 'Satki' tees from Kilobite! Her apology detailed that her doctors told her that she needed to eat more, gain weight, and ingest eggs. thyroid pills. Doctors also told her to take testosterone and She did not heed any of their advice at first, and admitted freely that she wished they would understand she wanted to only eat raw fruit and vegetables. She consulted other vegans who told her to ingest certain supplements so she did not have to change her diet. She gained weight and thought things would get better. But a few years later, she began to feel very tired and fatigued. What she attributed to her extensive traveling was actually a serious illness, where stomach bacteria had managed to get into her small intestine. With new health problems cropping up, she has now started eating eggs and fish, adding salt to her diet as well. While her health journey has taken its toll and a lot of people can sympathize (even if her vegan lifestyle choice had a lot to do with it), she is still selling her ebooks, 21-day program, transformational program, and other merchandise advertising a lifestyle she does not pursue for health reasons, even when she is not following the plan. This has lead to a downward trend to her followers, but her apology video has reached almost a million views as of publishing.